Wednesday was a day of mixed emotions. 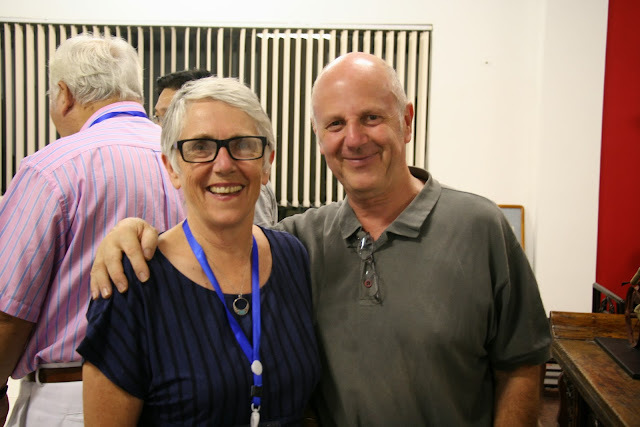 The morning was dedicated to the memory of Janet Mansfield, this was part of the reason I wanted to attend this conference as I knew how much Janet had contributed to its establishment and in some way I wanted to pay tribute to her by going. Coll Minogue had the honour of talking about her long time friend and associate along with Janet's son Neil Mansfield who also paid tribute to his mother. Janet's daughter, Gayl Leake and grand daughter Matilda Leake also attended the conference. 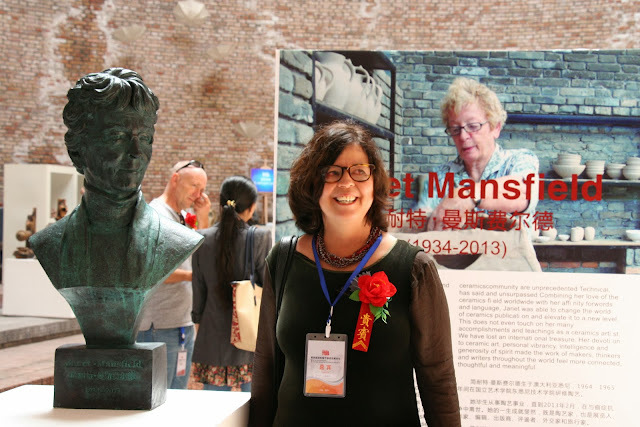 Gayl Leake in front of the bust and information about Janet in the emerging artist gallery. Mr Xu with Neil Mansfield, Gayl and Tilly. Wednesday afternoon after several presentations the editors reported on events in their own countries followed by emerging artist presentations. The editors met at Dr Hsu's for a meeting and then the rest of the delegates joined them at Dr Hsu's house where we yet again ate and drank Mr Xu's Australian wine. Caterina editor from Barcelona talking with David Cushman UK. Christian Faillat France, a new resident, and me. 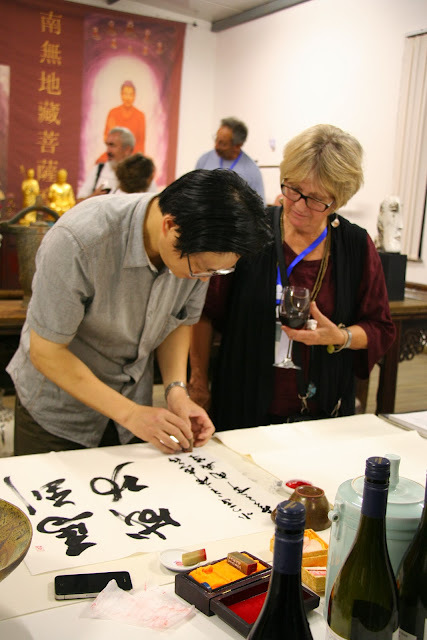 Elaine Henry with a calligrapher. 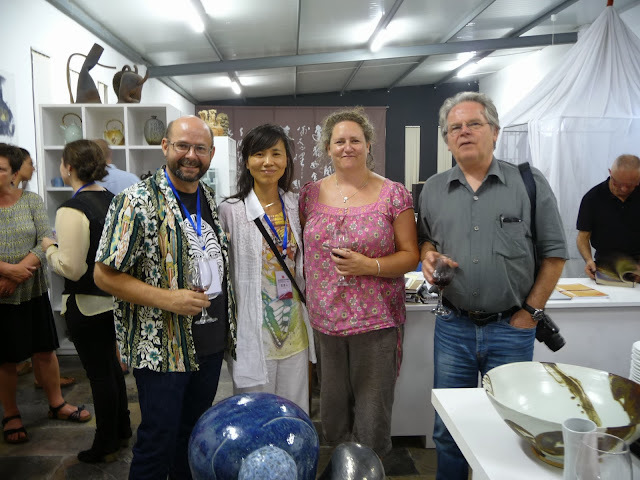 Brad Taylor US, Hyesug Park Taiwan/Germany, Tina Byrne Editor Ceramic Ireland, and Bernd Pfankuche Germany. Photo Hyesug. Thursday of the conference was the day for the Chinese delegates and guests to present. This was also the last day before the tour and many of us were departing for home the next day. It amazed us all how quickly we had become friends and were going to miss those who were not continuing on the tour. 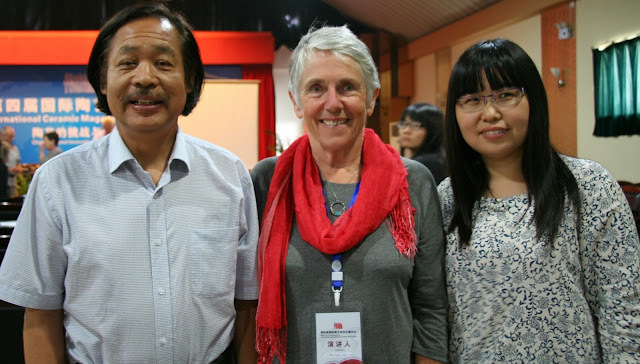 One of the highlights for me was the talk by Chinese master Chen wen zeng. 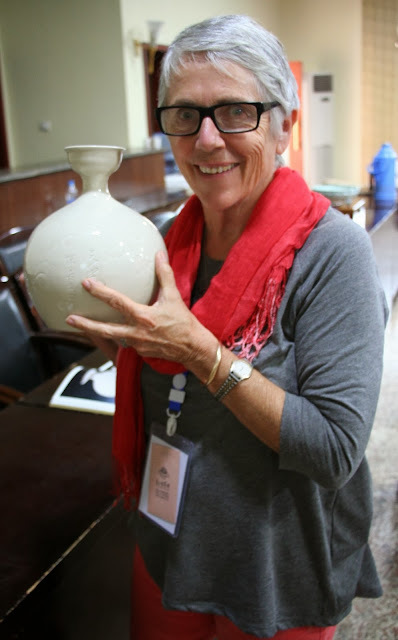 He made the most beautiful porcelain at the Dingzhou kiln, unfortunately an area we weren't going to on the tour. 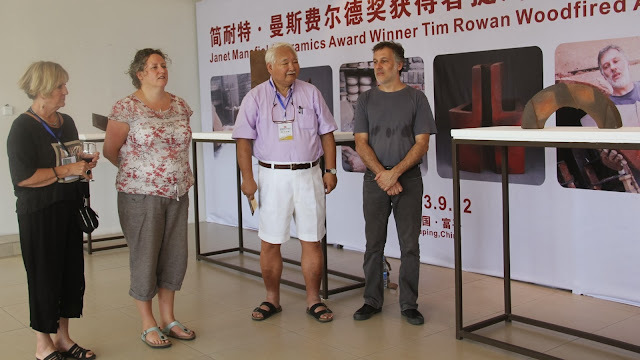 The other speakers spoke about the areas we would go to where Ru ware, Jun ware, and Cizhou ware were made. Chen wen zeng, me and his assistant I believe. He also bought along a beautiful brown bowl with hare fur glaze. The piece above was for sale but worth thousands of dollars, no wonder I look anxious. 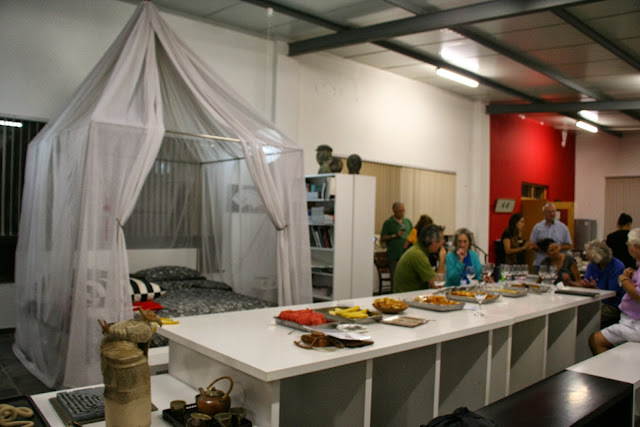 Chen wen zeng had works on display along with books. I did try to photograph some images out of his book and didn't have enough hands until Chen wen zeng noticed and kindly presented me with the book. I had to buy another suitcase to fit all the books and pieces of ceramics we were given throughout the trip, each museum or pottery we were handed a bag with books on the place we had visited. We had to be ruthless and leave some of the things behind as we couldn't fit them all in. 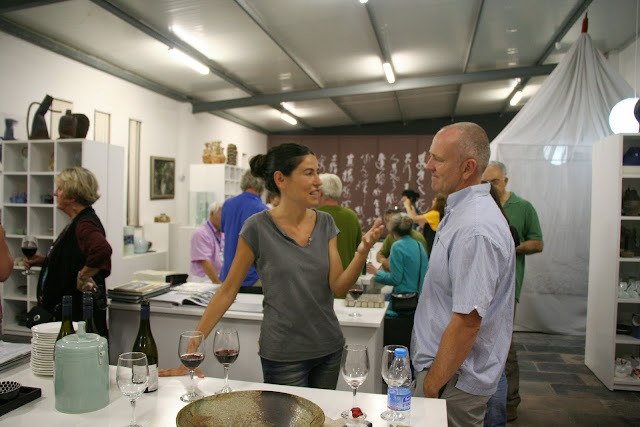 The opening of Tim Rowan's Woodfire Exhibition followed. He was the recipient of the Janet Mansfield Ceramic Award. He completed the work and fired it in the wood kiln during a residency at the Fuping Pottery Village. 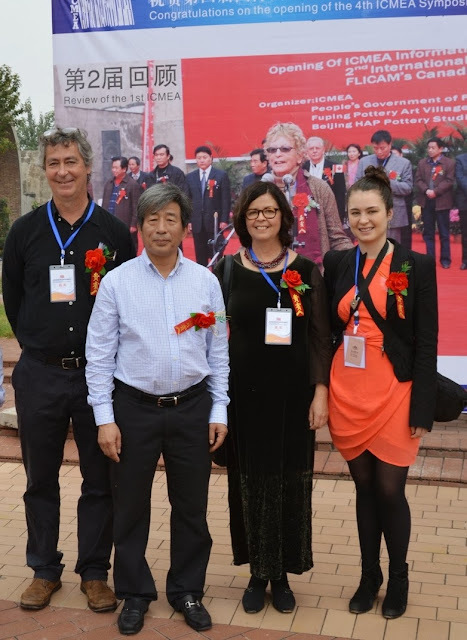 Elaine Henry, Tina Byrne, Dr Hsu and Tim Rowan at the opening. Labels: Janet Mansfield. Dr Hsu. Chen wen zeng. Tim Rowan.